During the holidays it just feels good to give a person a creative gift, one that you assume they’ll enjoy and appreciate. But the key word here is “assume.” Sometimes we assume wrong, and the gift does not make the recipient happy; in fact, it does just the opposite. I can recall one Christmas gift that I received from a loved one that I did not appreciate. It was a gym membership. Yippee. That was over a decade ago. Today I’d enjoy receiving such a thoughtful gift. But when I was morbidly obese and weighed in at 300 pounds, you’d better believe that I wanted to take that gym membership gift certificate and … well, I’m sure you can figure out what I wanted to do with it. But instead I just smiled and simply thanked the individual that gave it to me. Did I ever use it? Yes, it made for quite the lovely bookmark. My attitude towards the gym was not a very good one, obviously. Just the thought of entering a gym and approaching the desk to ask about a membership was enough to give me butterflies in my belly. Assuming I would be laughed at or ridiculed after I left the building was enough to keep me out of there. Plus, I did not want to be the one obese lady among all the other members with model-like appearances, who are only there to show off their amazing shape in the tightest spandex known to man. I assumed all these things would happen. Again, sometimes we assume wrong. I did. I’ve come to realize that most gyms are not that way. The majority of gyms include all sizes of people, and they don’t all wear spandex. Gyms are wonderful, comprising people from every age and weight group, with oversized sweatpants and simple cotton T-shirts as typical attire. 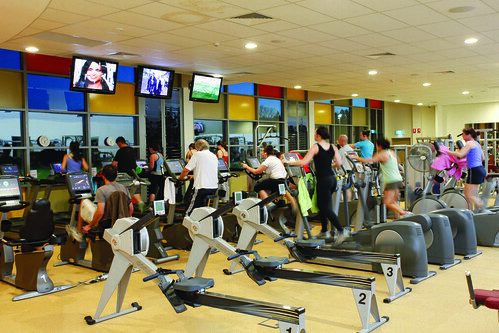 It’s common for a gym to be open most hours of the day and allow members to exercise when it best fits their schedule. Gym membership prices can vary depending on various factors. One thing is for sure: I never assumed that a person’s existing size would have anything to do with it. Yet I learned there are some gyms that feel it is OK to charge some people more than others for a membership—basically to “pay by the pound.” A recent ABC News segment, “Confessions From the Gym: Paying By the Pound,” featured a trainer admitting that gyms give better deals to thin people. Really? Many overweight people are already scared to go to the gym because they are afraid of being judged. Now some of them will be afraid of getting charged too much as well. This is surely not something that we’ll encounter in Michigan because I assume that we are all in this together, working as a team to strive for a healthier Michigan—gym owners included. Do you agree? Let me close today’s post by asking you to not allow stigmas and stereotypes from keeping you from working out in a gym—they really are a great place to help you to become more physically active. Please utilize any gift of gym membership and understand that it’s one of the best gifts you could ever receive. (If you need a bookmark, use the envelope.) Any gift that can improve your health and help you live a longer and happier life is truly priceless — don’t assume otherwise.